1970 Rip Curl Pintail 6 ft 3 1/2"
MANUFACTURER: Rip Curl Surfboards, 5 Boston Road, Torquay Victoria, Phone 612 252. Foam blank with black glueline stringer, tint and pigment volan laminate with 1 1/2 inch rail lap. Inverted scalloped deck to tail patch. Fin patch (post-production). 8 1/2 inch x 5 inch base x 9''span @ 5 inches. Three colour laminate with post-production fin patch. the fin patch is a crude post-production repair. 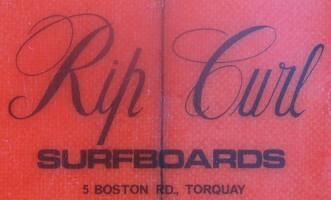 Rip Curl/address - black script and text at sweet spot. 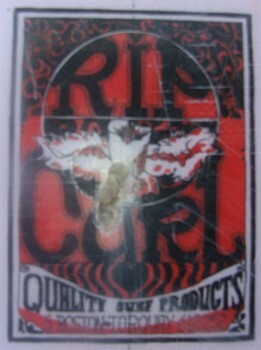 Bottom: Rip Curl/address - in decorated box at sweet spot, see below. Deck: 591 M.N. at tail. Deck: Red laminated tint with inverted scalloped deck to tail patch. Bottom: Mauve pigment laminate (?) with red tint rail overlap. Board donated by Graham Phillips, Shoalhaven Heads, NSW, September 2007. Graham reports he purchased the board from stock at a surf shop located at Tom Uglys Bridge, Sylvania, NSW in the summer of 1970-1971. 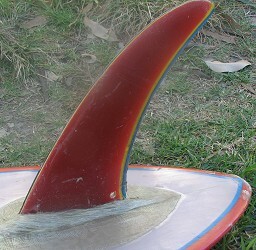 *In November 2007 I emailed Jeff Arkinstall at Surfworld, Torquay, enquiring if they had any record of a shaper "M.N." at Rip Curl Surfboards in the early 1970s. "RipCurl board with MN was shaped by Mick Nelson who worked down here at RipCurl in the early 70s." Thanks to Jeff and Bob for thier assistance. The continious down hard rails are a common development in Australia after the American and Hawaiian influence post the 1970 World Contest in Victoria. Soft cover, 96 pages, extensive colour photographs,27 b/w photographs. 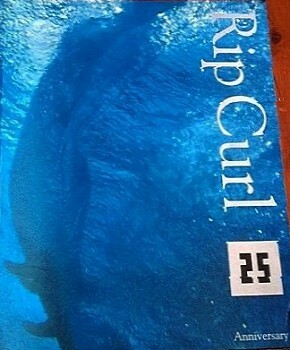 Rip Curl decal, damaged and repaired.